When Tracy Beaker is fostered by Cam, she thinks that life will be 'Happily Ever After'. However, she soon comes down to earth with a bump and has to face up to the reality of living with a foster mother who does not always let her get her own way. Cam's difficulties in this venture are also outlined by Wilson, who does so in such a way that the reader is led to see that there is more than just one side to a problem. One of these problems is school, to which Tracy's solution is to play truant. But before that happens, she also has to face up to meeting her own mother again; and because that does not go entirely as anticipated, it forces her into a more realistic view of life. 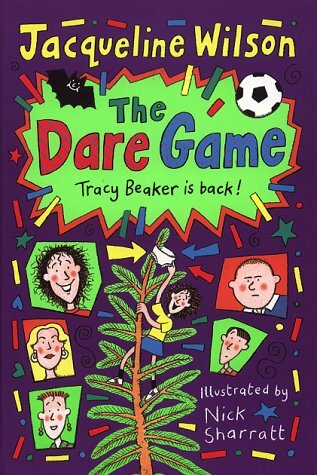 The growth in Tracy's awareness and issues about fostering, truancy, behaviour in school, friendship, the need for affection, and facing up to things are all skilfully and humorously dealt with in the course of this book. to this extent, The Dare Game could become a useful stimulus for classroom discussions. The humorous illustrations by Sharratt complement Wilson's text well.